Many years of development have resulted in a superb new waterproof tanking system that reduces the technical workload during installation, addressing and simplifying subtle issues such as corners and awkward joints. Buildings may look solid but they breathe. This is one of the reasons why even waterproof tile adhesives and grout will eventually form small sometimes invisible cracks that are the root of leaks and damp penetration. 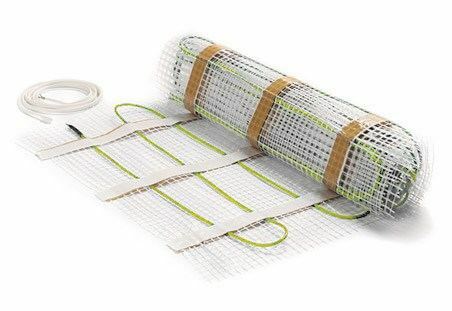 The solution is a 'cold applied' flexible membrane that absorbs the minute movement whilst presenting an impermeable barrier under the tile through which water simply cannot pass. So confident are the manufacturers that you get a Lifetime Guarantee with the product. No matter how accomplished you are with the application of a waterproof membrane, it can still prove to be fiddly when it comes to internal and external corners. With the Waterguard system this sometimes onerous task has been anticipated with the inclusion of pre-formed internal and external corner sections - simplifying installation and saving time. Additional components are available should you require extra. 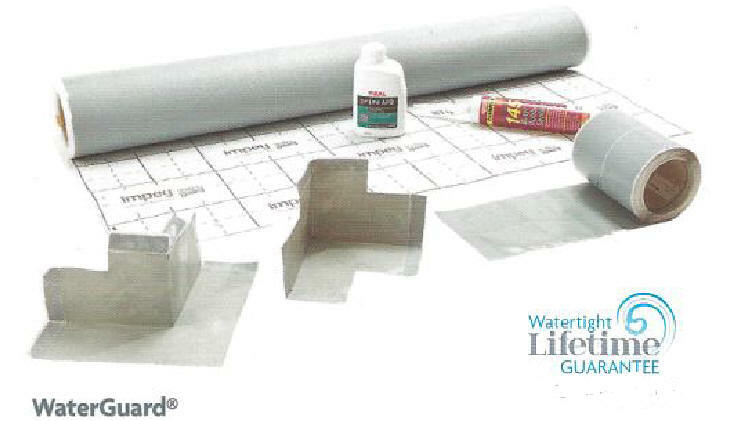 Waterguard not only offers a rapid method of installing a guaranteed waterproofing system, it can also be tiled on as soon as it has been installed. There is no time lost hanging about waiting for the product to cure, no extra days work having to revisit for the next phase of install, you simply move straight on towards a finished job. Arguably, there is nothing nicer than a warm tiled floor to wall on. Not only does it change the ambience of a cold tiled surface, it also improves drying time which reduces the likelihood of damp odours and the risks associated with a wet floor. This can be achieved fairly cheaply with electric under tile heating kits but these must be installed before you tile the floor. When used with a tanking system it is essential to ensure the heat generated by the heating element does not melt the membrane. Electric under tile heating is compatible with Waterguard providing you do not exceed a heat output of 100 watts/m2. Our under tile heating kits are fully compatible with the Waterguard tanking system. It has come to our attention that some suppliers are advertising this product at low low bargain prices but are in fact supplying a substandard lookalike. We are also aware that having ordered this product lookalikes are being supplied with the excuse of "zero of stock so a suitable alternative was sent." Please consider carefully before taking a chance with your installation. It's not worth the gamble. Waterguard has taken years to develop so it is unlikely that a lookalike will perform in the same way. Please advise us if you encounter 'cut price' lookalike products.